National Puppy Day is on Thursday, March 23 in 2017. We love puppies and we thought National Puppy Day would be a great time to remind you of some things that a puppy can bring to your family. It’s no secret that puppies are a lot of work, yet they can bring a lot of joy to families. If you are looking for a way to make good use of your time, a puppy may be what you are in need of. Puppies will keep you busy. They will insist you get off of the couch and encourage you to exercise. Puppies need to be walked and played with. If you enjoy moving around and sharing love unconditionally, a puppy may be a perfect fit for you. No matter the make up of your family, a puppy can bring happiness to your family. Kids of all ages enjoy puppies. They enjoy the friendly kisses that puppies love to give, as well as “that look” that every puppy owner knows. Who can’t fall in love with those sweet puppy eyes? Kids learn responsibility and what it’s like to give back. Puppies need love, cuddles and someone to take care of them. Puppies remind us that it’s ok to unwind and relax. Let your puppy lay down and relax in your lap. Once you do that, you will know that a puppy can bring you down to reality. We live in a world where we are on the go all the time. 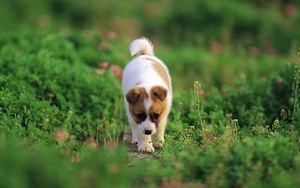 It’s true, puppies are busy, but they also offer some solitude that we all long for. For a little more relaxation, toss a couple pillows on the floor and snuggle with your puppy while you break out a movie or two. Celebrate National Puppy Day on March 23rd. But most importantly, celebrate your puppy 365 days of the year. Is a vacation on your horizon? Call us at 321- 794-4477.